SMART VENT - Built to Withstand the Devastating Force of Mother Nature. During a flood event, poorly protected homes will give way to hydrostatic pressure caused by quickly rising floodwater, crumbling foundations and buckling garage doors. The hurricane and flood resistance of many homes can be substantially improved if steps are taken to reduce the chance of structural damage from floodwater. ﻿Installing SMART VENTS can substantially lower your flood insurance premiums saving you money every year! Some of our customers have even reported their SMARTVENT products paid for themselves the very first year! List of available models and dimensions. 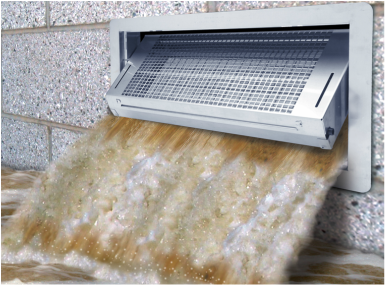 •Patented automatic float system that allows the flood door to automatically rotate out of the way of floodwater leaving an unobstructed path that relieves pressure on the foundation wall. •Each Smart Vent protects 200 square feet of home vs. only 60 square feet per each non-compliant vent used. •Preserves the aesthetic beauty of a home by requiring 2/3 less vents. •Temperature controlled louvers open/close automatically with temperature change. •All stainless-steel construction meets or exceeds flood resistance code requirements. •Eliminate Liability. Smart Vent is the only Code Compliant, FEMA Accepted and ICC-ES Evaluated vent available.